One of the most important British television series ever made was Dad’s Army. It is historically significant to the time the series takes place and the subject matter of the show. The series is funny and showcases a cast of characters that are instantly loveable. The show is a piece of national heritage in the UK and it transcends beyond the realm of just comedy. The reason is that there is passion to the series. It’s passion from the actors, many of whom did some sort of service in World War II but I think it really stems from the writers Jimmy Perry and David Croft. There is nothing like it. For many people, memories of Dad’s Army centers on great slapstick moments from the colour series or one of the most famous episodes that come from Series 6 The Deadly Attachment. There is a different side to Dad’s Army which I forgot about. It is sweet and poignant. It tells a different story because it is a different comedy. It doesn’t centers around huge set pieces but stems from the struggles of a nation about to be invaded. The episodes I watched for this article come from Series 1. Sometimes I avoid Series 1 episodes of shows that have been on for a long time because the characters are still cooking so to speak. They are not done yet. Series 1 of Dad’s Army is different. The characteristics of the characters are there but there is a little more. This is the third ever episode of Dad’s Army and it needs to be treated with the respect it deserves. 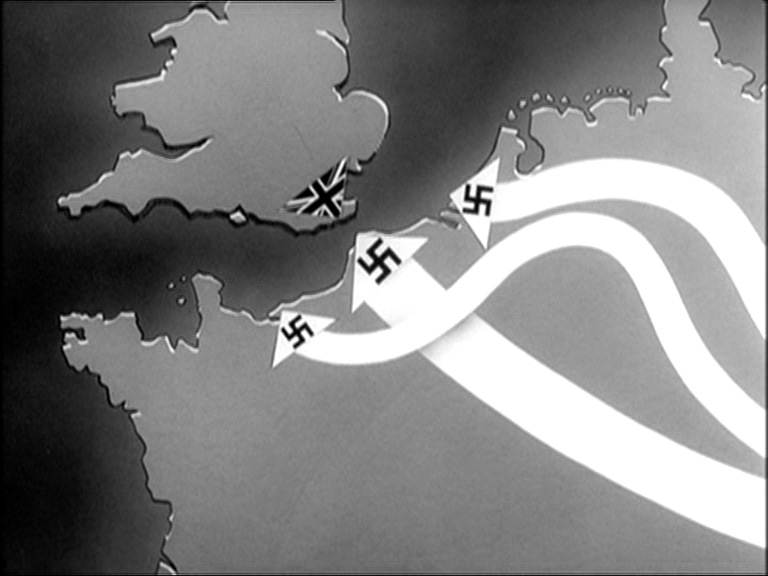 When I started up the episode and those famous animated images comes up in black & white of the Nazi strands trying to get over to the UK in the title sequence with Bud Flanagan’s voice singing over it, I was in a moment of awe. I have seen this title sequence many times over the years but it has been a couple of years since I sat down and watched Dad’s Army. I just got excited to see it. It starts out so confidently conveying the very real threat to the UK in World War II while be amusing but not too amusing. Like everything done in the series, where the humour was involved, it was all tastefully done. One very unique piece that was seen throughout the first series was how every episode opened with a “newsreel” of how the war is going and how the brave citizen volunteers are keeping up their spirits! It makes Series 1 stands out but I am happy they didn’t continue these “newsreel” openings into Series 2. That being said, it really helps set out Series 1 as almost being a completely different show than what follows. The episodes that have been available in the US (and even shown in the US) plus what repeats are seen in the UK are generally the colour episodes. At that stage the Home Guard was very well established in the town Walmington-On-Sea which is where the series is based. Series 1 is really how the platoon all started. 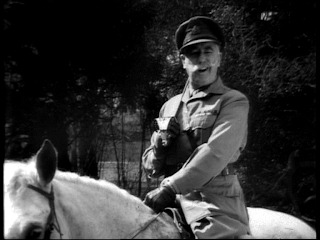 The previous 2 episodes focused on George Mainwaring creating a group of Local Defence Volunteers. I think that is one of the things that jogged my memory from this episode is how ill-prepared they were but the patriotic spirit was overwhelming. 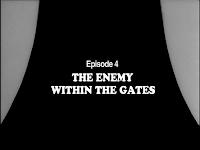 This episode consists of the platoon getting more discouraged by the lack of any real equuipment such as guns. Captain Mainwaring promises the platoon that they will have weapons by the end of the week. This is not a promise Sgt. Wilson would have made and continues to remind Mainwaring of it throughout the episode. One day at the bank, Mainwaring and Wilson get a visit from Colonel Square. Square does not want to join the platoon; he wants to take it over. Of course Mainwaring wants nothing to do with this. He doesn’t want to hand over his command to this “old fool” but then suddenly Square makes a revelation. He has over 20 guns! 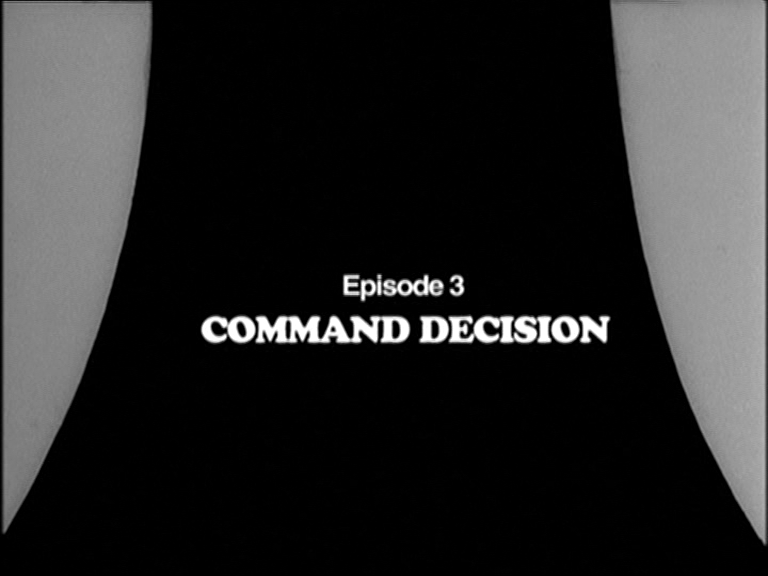 Mainwaring has a decision he has to make. 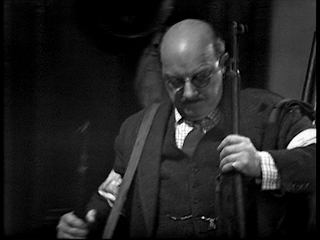 Captain Mainwaring, especially in later episodes, is portrayed as very pompous and self-important. In this episode, all he cares about is his platoon and his country. He decides he will march the platoon over to Colonel Square’s house to hand over command of the platoon to him. Colonel Square’s ideas of how to run the platoon are old fashioned to say the least. The guns he promised are vintage muskets and he wants the entire platoon to be completely mobile by horseback. Worse than that, the horses (which don’t even belong to Square) are circus trick horses. So instead of them being battle ready, all they do is parade in circles and do tricks. Of course some of the tricks done in the episode are nothing more than camera tricks; it’s fun to watch the character’s reactions (such as Jones) on the horse. 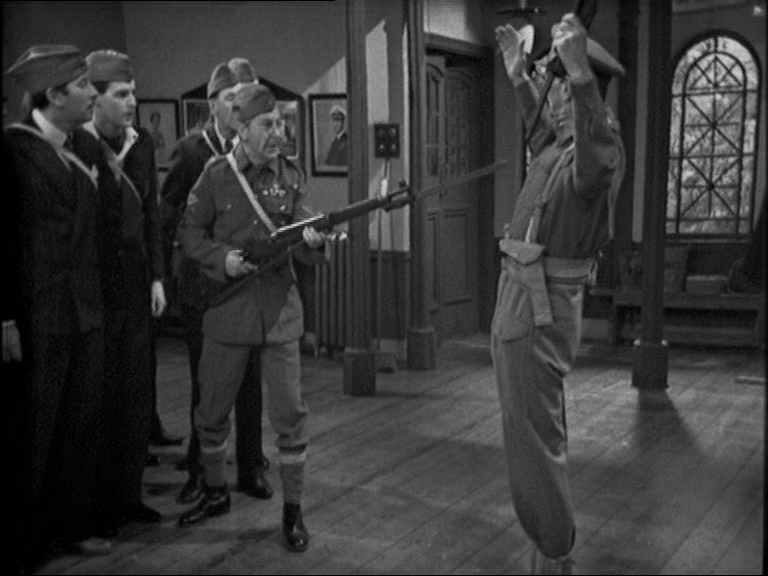 With that Mainwaring takes back command of the Platoon and marches them back to the church hall where they hold all of their drills. All of Mainwaring’s sacrifice and loyalty pays off in this last scene. While the platoon is in the hall waiting for Mainwaring to come out to address them, he is in his office doing some work when a soldier stops by. He needs Mainwaring to sign off on some military equipment. At this point something very significant happens. The group changes from being the Local Defense Volunteers to being known as the Home Guard. What Mainwaring does not notice is that the soldier also dropped off…..some rifles. As the group is getting louder out in the hall because they want Mainwaring to come out and explain why they don’t have their guns yet, Mainwaring is just staring at these rifles in disbelief. He takes all the guns and goes out to the hall. What makes this a great scene is that even though Mainwaring goes out to the hall, the camera stays on the empty office. As he goes out to the hall, there is a moment of silence and then uproarious cheering! It is a simple but magical scene that is a wonderful payoff for the viewer. No matter how pompous Mainwaring may get, I always want to see good things happen for him. His shortcomings are what make him human. Some things that really stood out for me was how the platoon was dressed. There are no uniforms. They are dressed in street clothes which sometimes were just old suits. There is no uniformity to the group which really punctuates the rough start to their platoon. It is all very rough but that what makes these episodes really fun. It’s hard to believe but these guys actually look relatively young. I think the combination of these guys looking young and in black & white gives this series have such a different overall feel to anything else done in the later years. While giving a lecture Mainwaring is interrupted by a Polish Officer announcing that any Nazi parachuter captured will receive £10. 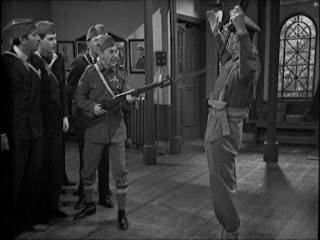 Neither Mainwaring nor the platoon believes he is an officer due to his heavy accent. Of course, Captain Winogrodski is who he says he is and he has taken note that this platoon is a bunch of imbeciles. His announcement was timely as Mainwaring was doing a lecture about Nazis landing in the UK and they may even be dressed as nuns which is an ongoing theme in the series. That night while on patrol Jones, Walker and Pike capture two Luftwaffe airmen. That actually was the second thing they captured. They first shot a swan they thought were airmen. Once they get the airmen back to the church hall, Mainwaring gets in touch with General HQ to come and pick up the prisoners. Walker is happy since that means they will get £20. Unfortunately Godfrey allows the airmen to use the bathroom and they escape. 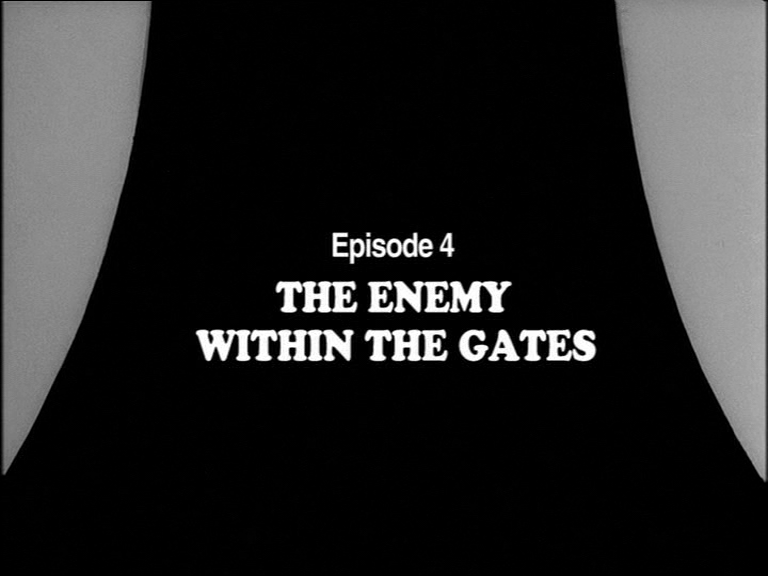 Finally, Winogrodski returns the airmen and berates Mainwaring for allowing them to escape. 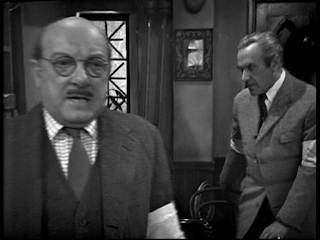 Mainwaring returns to his office as guards from GHQ show up to get the prisoners. Walker explains to them that Winogrodski is also a Nazi disguised as a British Officer. They take all 3 away and the platoon gets a £30 reward. 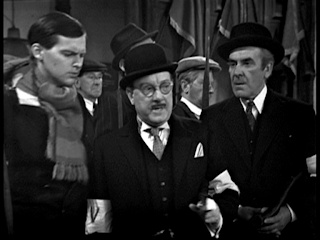 Mainwaring is confused why it is £30 and not £20 but Walker explains that a third airman turned up that they captured. Mainwaring is very happy and suggest that they use £5 to celebrate with a big dinner for the platoon. Walker has an idea; he knows where he can get a swan very cheaply! This series is great because of the characters. Even ARP Warden Hodges, with this being his second episode, is likeable. The casting to this series is superb. Because the entire platoon has such amazing features that they are almost caricatures. According to Wikipedia, one of the German airmen was played by Nigel Rideoutas and he was paid an addition £10 for writing some of the German dialogue. There is a lot of German dialogue between the two airmen with a lot of onscreen captions. 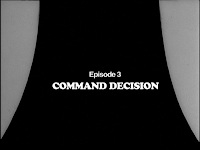 One thing notable in the first series is how the closing credits keep changing form episode to episode. 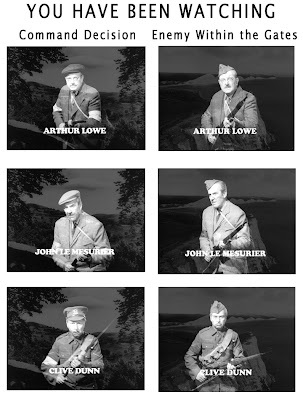 The closing credits start off with a picture of some British countryside or in this episode White Cliffs and superimposed over them is the cast one by one marching in place. The backgrounds are always cool pictures and between the episodes the cast is marching in place wearing different “uniforms” which is showing the evolution of their platoon. It’s fun to watch. 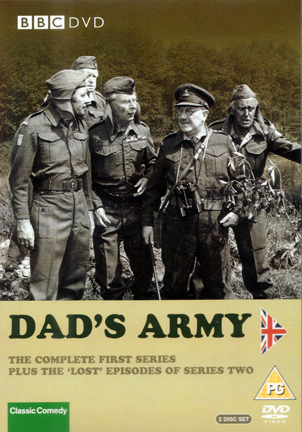 BBC DVD started to release Dad’s Army in September of 2004. What makes these releases very worthwhile is that they have been restored by much of the same people who restored the Doctor Who releases. So the film has been completely cleaned up with the VIDfire process applied to return the episodes to the original video look of when it was first broadcast. Opening and closing credits have been remade and gives the series a visual touch up of love and attention it deserves. It has been said Dad’s Army is timeless. I believe this to be true. When scenes change, we are treated to popular music of the time which gives it great authenticity to the era. I love this music! The characters are loveable but in the first series it is different. As many of these series do, Dad’s Army begins to have too many catchphrases for each character. Series 1 has the episodes that are more focused on the characters and what they did to create a platoon that would protect Walmington-On-Sea. This truly was the beginning of a legend. If you haven’t seen it check it out; I don’t think you will be disappointed. When I watch the Doctor Who story The Mind Robber in the mid-1980s there was an actor who stood out over everyone else through his performance. This was Bernard Horsfall. I know I had seen him before but he stood out in this story. 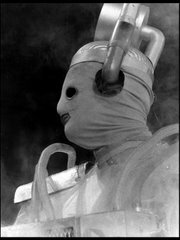 Then I started to notice him in other stories such as Planet of the Daleks and The Deadly Assassin. Then I started to notice him in other series such as Doomwatch, The Avengers and Pathfinders. He also played a great role in On Her Majesty’s Secret Service. Everything he appeared in he had a presence. It was always a joy to see him turn up in other programs. Sadly, he passed away this week at the age 82. For us American fans, it would have been nice to meet him at the upcoming Gallifrey convention in LA. He was a guest and it would have been phenomenal but it wasn’t meant to be. 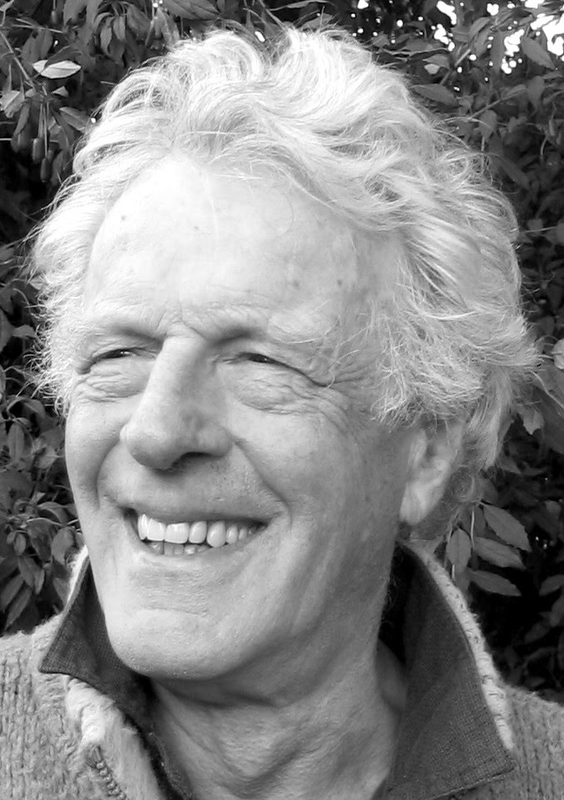 Regardless, Bernard Horsfall was one of the great actors from an era of British television that doesn’t exist anymore. Farewell sir; you will be missed. Next week: We are not done with World War II comedies just yet. For the next couple of articles I am going to look at a very different kind of comedy with Series 2 of ‘Allo ‘Allo! Why am I writing about Series 2, you’ll have to read it to find out! The first time I tried to watch Dad's Army, I did not like it. The second time I tried to watch Dad's Army, I did not like it. I did not try a third time until (for reasons I still cannot explain) I bought the complete dvd set. I tried to watch Dad's Army for the third time and I liked it! I would have to agreee that as the series wore on, the catchphrases started flying thick and fast, but by that time I was enjoying it enough that it did not distract from the viewing. Speaking of catchphrases flying thick and fast, no show does it better than 'Allo 'Allo. I look forward to seeing what you have to say only once. I seem to recall it taking a couple of times before I starting to really get into Dad's Army. It was back in the VHS days and the series was being released 3 episodes at a time. It was daunting. Though as usual I was collecting them in PAL. It's funny that even though you didn't like the series you bought the box set. We are a rare breed! Taffy is a slang term for Welshman. It appears Walker is being mean to Frazer for basically calling him a Welshman when he is so obviously Scottish.